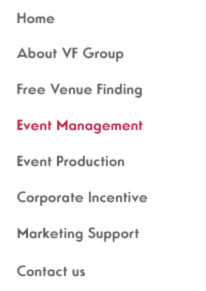 VF Group Conference & Events Management Team are a specialist team of conference and corporate event organisers across the UK and Overseas with 16 years of experience. Through the years VF Group have ensured all our services are of the highest quality, whatever corporate event you are planning from incentives, conferences, meetings, product launches, gala dinners, teambuilding and award ceremonies our business is your event. From smaller meetings to international conferences, we always approach each job with the same commitment and professionalism. VF Group plays a pivotal role as a single point of contact managing an entire project or, if you prefer, just a few chosen services. From the initial selection of your venue to post-conference and event evaluation, successful conferences and events need clear objectives; precision, planning, careful project management and regular monitoring of deadlines and budgets to make sure everything stays within agreed conference & event management limits. When you work with us you will immediately realise nothing is a problem, no matter how large the corporate event or conference you ask for, we have the organisers and the event management experience to provide fantastic results. We pride ourselves on knowing that our clients will turn to us time after time in the knowledge that their event will be in safe hands. Our outstanding customer care and innovative solutions have established us as one of the UK & Overseas leading event management companies. When the VF Group organise your event, you can be 100% sure that we will help you manage all the many details that must be addressed to insure a trouble-free meeting or event. The next time you are asked to “just organise” next years annual meeting or any other event, think about this... it’s easy to underestimate the time it takes to organise any event, from finding a venue, delegate management, designing events, audio visual requirements, online registration, name badges, welcome packs etc. ... sometimes it’s easy to forget that you have a “real” job. When others said that it can't be done . . . Venuefind performed the work with ease. Over the past seven years, Venuefind are the most professionally minded individuals that I have ever met. Highly regarded and recommended. Venuefind really know this business. I can be assured of Zari’s seamless execution of any event. They accommodate all our needs, secure great deals within budget, suggest ideas that we thought were not possible – all resulting in a successful event.